You are cordially invited to join other members of the Cornell community for the 31st Annual Traditional American Thanksgiving Feast! Our festive menu includes New England Clam Chowder and Winter Vegetable Bisque, Roast Turkey with Gravy, Poached Salmon with Lemon Beurre Blanc, Chef inspired Grilled Tofu Steak, Cranberry Sauce, Szechuan Green Beans, Purple Mango Rice, Mashed Potatoes, Candied Yams, Pumpkin and Apple Pie, Assorted Cheesecakes, and lots more. 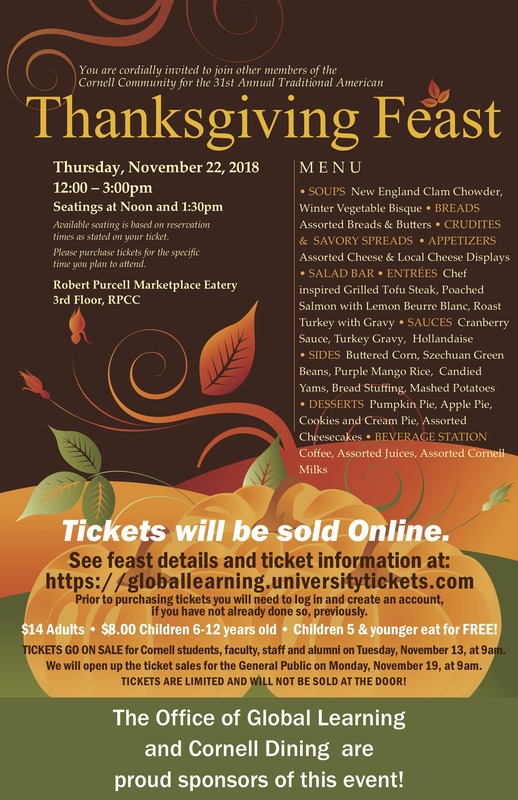 Tickets will be available online at globallearning.universitytickets.com beginning November 13th at 9am for members of the Cornell community, and November 19th at 9am for the general public. $14 Adults • $8 Children 6-12 years old • Children 5 & younger eat FREE! Volunteer and eat for free! Needed: Responsible students and scholars who are willing to work one three-hour shift in serving food, cleaning tables, and/or washing dishes in exchange for a free ticket. Mandatory information session for volunteers on Thursday, November 15th at 4:30pm at 100 Caldwell Hall. This event is sponsored by the Office of Global Learning and Cornell Dining.